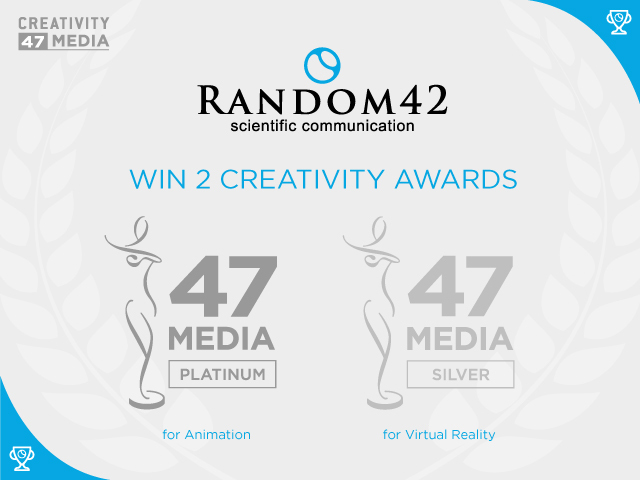 Random42 Scientific Communication have been awarded a Platinum and Silver Award at the 47th Annual Creativity International Media and Interactive Design Awards. Random42 have a very successful history with the Creativity Awards, having been presented with ten awards over the past five years. To learn more about the 2017 Creativity International Media & Interactive Design Award results and view some of the Winning Entries please visit the Winners Gallery. Random42 have won over 150 industry awards in their 25 year history, to view a full list of accolades visit their Awards page. Random42 Scientific Communication is a leading scientific communication studio specialising in medical animation and education, virtual reality, interactive and visually engaging solutions for global pharmaceutical and biotechnology companies. In their 25-year history they have produced core digital assets for over 550 product launches to date and won over 150 industry awards. Random42 are pleased to announce they will be exhibiting at Bio-Europe Spring. The convention runs from March 25th–27th and is being held at the Messe Wien Exhibition and Congress Center, Vienna, Austria. London-based scientific communication studio, Random42, have released their first solely educational virtual reality experience that takes you on an immersive journey inside the human body. The experience, entitled Intercellular, takes a more cinematic approach towards an educational virtual reality (VR) experience designed to educate and engage the user with the fascinating scientific processes that take place within the human body. Random42 will be attending the ASH annual meeting in San Diego from December 1st – 4th. Random42 will be attending The Jefferies 2018 Healthcare Conference taking place November 14th and 15th in London. Random42 will be attending BioEurope in Copenhagen from November 5th – 7th.